Yes, the Boho is now an FO! Finished, finished, finished! Just a little colourful. I may not have the chutzpah to wear this outside the house in daylight! When draped around me, ruana-style, it comes past my knees. The final measurements – 74 inches long by 42 wide. Total weight of yarn used – about 1200 grams. I started this on November 23rd 2015, so it took me almost eight weeks. Of course, I wasn’t practising project monogamy that whole time. I was concerned that a couple of spots looked too bright. Using up scraps can be somewhat unpredictable and so I added a few lines of surface slipstitch to dilute too light areas. I also reinforced the V at the back of the neck with a few slipstitches as I can see that being a place of stress. Now I have to weigh the leftovers and update my Ravelry stash page. And after that, frog that black scarf-skirt. Then I’ll be down to two WIPs, the granny blanket and the granny slippers. Hmmm, I’m sensing a theme here. January 1st 2016. A new year to remember when writing the date multiple times at work. I wonder how often I will write 2015 and have to change it?! My shifts were switched so I didn’t have to work today, but the big sale is on for two days so tomorrow I will have from 9 to 5 to enjoy some retail frenzy! I always set my intentions on the short drive to the store – happy satisfied customers, friendly co-workers and a good day all around. We will have lots of staff on again tomorrow, and I guess I will have to approach it as fun rather than something to get nervous about. This has been quite a week so far. Monday, Wednesday and today (Friday) we were up at the ski hill. We don’t normally go so often, but with ds2 (the keener) being on break from college, I decided to make the most of my non-work days. He has thoroughly tested out his new board and boots, and also ds1’s GoPro. Ds1 came along for two of the days and today set up the GoPro on his brother’s helmet. Ds3 didn’t bother getting out of bed for any of it! Tuesday and Thursday I was working, and also tomorrow and Sunday. So I decided not to snowboard today, but instead to spend the time in the lodge with my iPad (Ravelry browsing and Netflix [Orange is the New Black]) and crochet. 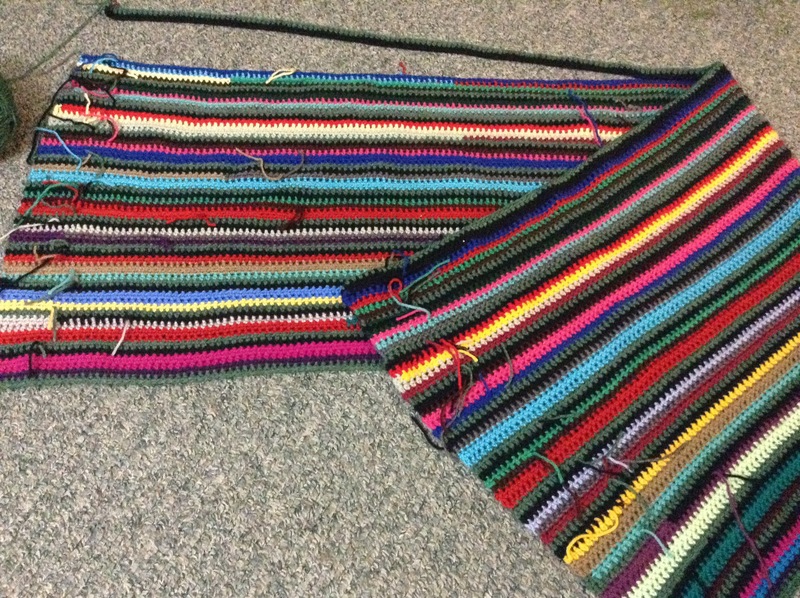 This is the progress so far on the Boho Cozy Wrap. The ends are mostly woven in. When the size of the second half matches the first half, it will be done! Wishing you all a very happy New Year and I hope 2016 brings lots of love, light and joy to you. The Boho Cozy Wrap is 50% done. I just did the bit where you crochet across halfway, chain for the rest, then hdc back. That’s what the sticky-out-bit is at the top of the photo. That’s the split which will sit around my neck when it’s done. There will be lots of end-weaving on this project, but I like that I’m finishing up a bunch of oddments of worsted weight yarn. The parts I’m not crazy about, like the light green and yellow, I will try some surface crochet or weaving to mute the effect. I grabbed all my worsted weight yarn, all three bags of it, took out the cream, and started in on it. I have made mine larger, a decision which I may come to regret if the thing ends up dragging close to the floor! Instead of 142 chain, I started with about 200. It’s just half doubles back and forth and to contain the randomness a little I’m using regular(ish) stripes of a tweedy green and a black. Two days of crocheting have yielded a piece that’s 73″ long by 7.5″ wide. It’s actually a perfect scarf size right now. I’m second-guessing my choice to leave in the yellow and pale green (the latter is showing as a very obvious bright strip in the photo) so now I wonder whether I should just continue to make a solid rectangle and call it a blanket. I don’t know if I’ll wear it out and about with the current colour combo though I am of the opinion that the more colours you put together the less any one of them will stand out as not fitting in. I don’t have to decide yet though. There are 20 rows done and at least 20 more to go until the instructions for the neck division so I shall mull it over as I crochet.